On Nov. 30, the U.S. EPA released a final rule to set 2019 RVOs under the RFS. When compared to the proposed rule, the final rule increases the RVOs for cellulosic biofuel, advanced biofuel and total renewable fuel. A new proposal released by the Ontario government indicates the province could require gasoline to be blended with 15 percent ethanol as soon as 2025. The U.S. ethanol industry has applauded news of the proposal. 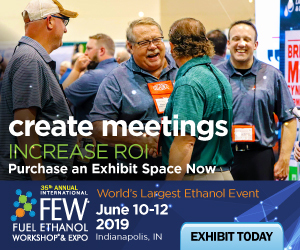 Over the past few days, the Trump Administration has announced progress on trade deals with Canada, Mexico and China that could have a positive impact on export markets for U.S. ethanol and distillers dried grains with solubles (DDGS). House Ways and Means Committee Chairman Kevin Brady, R-Texas, has released a tax and oversight legislative package that includes extensions for several biofuel-related tax credits, including those for renewable diesel and second-generation biofuels. A new EIA study concludes that U.S. petroleum refineries would have “no problem” meeting a requirement to produce gasoline with a higher minimum octane rating (95 RON) beginning in 2022, and assumes refiners would not use more ethanol. ICM Inc. has announced that it will implement its systems at the newest FS Bioenergia plant in Sorriso, Brazil, including Selective Milling Technology, Fiber Separation Technology, and Base Tricanter System. On Nov. 28, Rex American Resources Inc. released financial results for its fiscal third quarter, which ended Oct. 31. The company reported a year-over-year increase in net sales and revenue. Rex holds ownership in six ethanol plants.